All Indian magazine and ebook provided to readers, all kind of magazines as pdf in Hindi and Bengali language. So readers can collect this bengali ebook free. 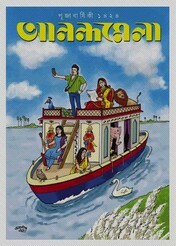 'Anandamela' is the most popular Bangla Magazine for children. This magazine isn't just for children, all ages people are like to read this famous magazine. Anandamela is a hole life companion of many Bengali readers. This magazine meets all the curiosity of children's mind like Sports from science, comics from the story, Astronomy from Adventure. This magazine has been publishing fortnightly, publish 5th and 20th date of every month. But every year, the magazine has been publishing a special issue for Durga Puja festival. Now I want to share a special issue like this, issue in 1424 (2017). This especial edition's cover stories are- seven complete novels by eminent and well-known authors, entire color Feluda comics, entire adventure comics- 'Chora Hati Shikari', complete comedy comics- 'Rappa Roy O Sonar Harin', four special stories by Smaranjit Chakrabarty, Prachet Gupta, Ritika Nath, Nabanita Dutta, and other topics about science, myth, literature, sport, and many more attraction subject. Collect this patrika in pdf. All dear little friends, you can collect this Pujabarshiki Patrika- 'Pujabarshiki Anandamela 1424 (2017)' in a pdf file or read online from this post. Advertisement- Readers can collect all kind of Bengali, Hindi magazines pdf. Friends, from this blog you can collect all Indian magazine which may be publish on daily, weekly, fortnightly, monthly, yearly in pdf file. Specially Bengali Magazine. So stay with us and collect the latest patrika.